If you are still looking for the ideal Monitor for FPV or aerophotography, The M800 is your best choice, and 30% viewing aera more than M700. Designed specially for FPV and outdoor operation purpose. 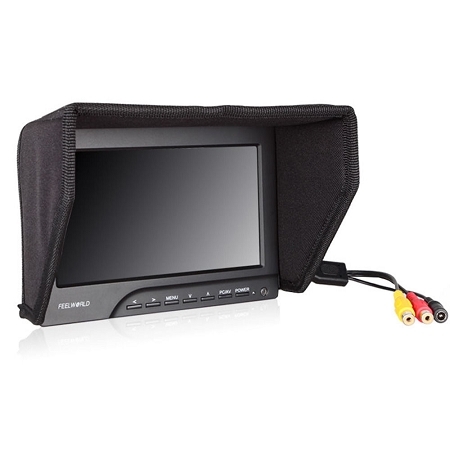 The monitor has very bright image(adjustable) and very wide power supply range(7-12V). M800 also has a very important feature for FPV users, it doesn't have "blue screen" problem when the signal gets weak. This feature makes you able to fly much further and never lose image. Note:The default display mode is PAL,if you use NTSC cam or other format, please choose it in the menu to get the most suitable view on the monitor. Supported video format: NTSC M, PAL M, NTSC BG, PAL N, NTSC DK, PAL DK, PAL I and SECAM BG.